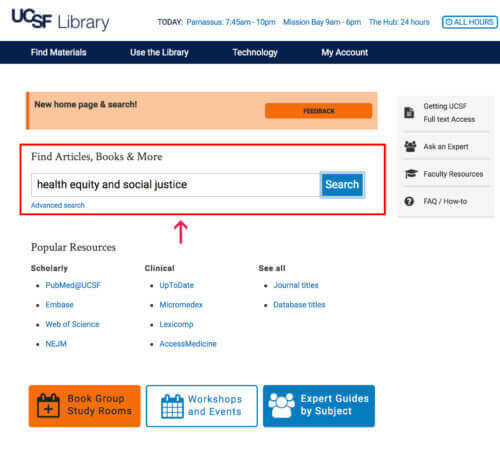 The UCSF Library has launched a new search tool on its website. Filters and facets are used to narrow your search results to a more refined set of items. These tools appear along the left-hand side of the Search Results page. When reviewing your results you can now click or hover over the Preview link for an at-a-glance view of the contents for each result. Like PubMed and many other search interfaces, the search filters are persistent. That is, they stay set for all your searches until you change/clear them. While our new search tool is great for discovery to enhance your research journey, some in the UCSF community have a few core resources that they return to over and over. For those of you that know exactly the journal or database you need, we still offer those paths as well under Popular Resources. Just select any of the featured links to go right to PubMed @UCSF or Journal Titles, etc. After exploring the new search tool, please share your feedback with us. We look forward to continuing to improve your Library experience online and in-person.